Still waiting for final results to be posed by the Howard County Board of Elections, but there are some additional numbers in that allow a rough comparison of voter participation in the 2006 election compared to past elections. According to the Baltimore Sun’s article Absentee ballots leave results unchanged there are 2271 provisional and overseas ballots to be counted. The current state 2006 results for Howard County are here. If all 2271 ballots are valid, there were 105,651 votes cast in the 2006 Election. 53,260 votes – Governor Ehrlich. 42,438 votes – Kathleen K Townsend. How did this affect the race for County Executive? Well, according to the Sun, currently Chris Merdon is more than 8000 votes behind. It is not the critic who counts, not the man who points out how the strong man stumbles, or where the doer of deeds could have done them better. The credit belongs to the man who is actually in the arena, whose face is marred by dust and sweat and blood. Who errs, and comes short again and again (but)… who knows the great enthusiasms, the great devotions, who spends himself in a worthy cause; who at best knows in the end the triumph of high achievement, and who at the worst if he fails, at least fails while daring greatly, so that his place shall never be with those cold and timid souls who know neither victory or defeat. The Columbia Association’s Board of Directors found no merit in the claims brought forth by Mr. Santos against Ms. Russell and Ms. Coyle regarding their political endorsements. The Board also found no merit in the claims against Mr. von Schlag by Ms. Coyle regarding his prior political involvement. In addition, the Board received a legal opinion that indicated there was no violation of Internal Revenue Service Rules. I don’t want to rehash the whole forum issue. However, please indulge me a bit. The Blogger forum was sponsored by four of the Howard County blogs, who attempt to provide almost daily commentary on local issues and campaigns. Many of the questions asked of the candidates were standard forum fare – education, growth, transportation, etc. Wallis answered and Merdon answered. Learn more about the value of technology in today’s education, what other school districts are doing with “One to One” computing and what the experts say by visiting a few of the sites listed below. Read The Metiri Group’s review and analysis, learn about the Maine Learning Technology Initiative and other school district and state programs, or watch educator-created videos of 1 to 1 learning in action. techLearning.com – Laptop Computing – anywhere, anytime. Learn more by downloading the “1:1 Computing Guidebook” with free registration. K-12 Computing Blueprint – This web site is a resource for education leaders and others interested in implementing one-to-one anytime, anywhere computing in K-12 education. View articles or download reports (requires free registration). National Education Technology Plan – Official site of the National Education Technology Plan for the U.S. Department of Education, the plan lays out a framework for transforming education. Browse success stories, action steps or the plan itself. National Center for Education Statistics (NCES) – Located within the U.S. Department of Education and the Institute of Education Sciences, NCES is the primary federal entity for collecting and analyzing data related to education. International Society for Technology in Education (ISTE) – ISTE is dedicated to providing leadership and service to improve teaching and learning by advancing the effective use of technology in K-12 education and teacher education. Bill Gates Speech – National Education Summit on High Schools – Read what Bill Gates had to say regarding technology and education – find the entire speech on his take on the state of America’s high schools. Talbot County, Maryland instituted a laptop computer program for its incoming Highschool freshman. In doing so they contracted with the Johns Hopkins University Center for Technology in Education to act as an external evaluator of the 1 to 1 Laptop program. The Talbot County Council considers an issue today that is important now and for the future of the county’s public school students and for the future growth and development of the county’s workforce. EASTON, Md. (AP) – Talbot County’s program giving laptop computers to all high schoolers got high marks from a recent Johns Hopkins University study. The school system’s 1 to 1 Laptop Initiative put the computers in the hands of all ninth-graders. According to Lynne Harper Mainzer, head of the university’s Center for Technology in Education, the ninth-grade laptop students had “significantly higher” scores on the algebra portion of the High School Assessments. The 480 laptop students also scored “significantly higher” than the non-laptop class of 2008 students in their algebra I classes, Mainzer said. Ninety-three percent of the students rated their computer skills as intermediate or higher. From the mid-year review to the year-end evaluation, there was a 25-percent increase in the number of students who rated their skills at the expert level, The (Easton) Star Democrat reported. Students are using the laptops for writing, taking notes, completing homework assignments, keeping organized, communicating with classmates and teachers, and researching on the Internet. I post this knowing that there are some concerns about Chris Merdon’s proposal to provide laptops as part of his committment to education and making Howard County the best school system in the nation. Mary Catherine Cochran sent this open letter to me and Hayduke regarding the 22 Democrat and Independents who endorsed Chris Merdon on October 23rd. I was hoping that all of this would just blow over… silly me. You may use this, unaltered, if you like… or ignore it- as you wish. It was I who cut and pasted names and comments and titles that were submitted to me into the press release. The inception of the idea, the organization of the press conference and the creation of the press release was done in the space of about 36 hours. There was no single organizer… it was more of a coming together of right minded activists. Most participants remembered to tell me their names and comments, but neglected to tell me titles or party affiliations. I filled in the blanks from what I knew. I thought the titles were an important means of identifying what issues or areas of the county that each person represented. I thought it was great that we had folks from Columbia and that we had farmers and attorneys and environmentalists. I believed it showed a diversity of background and I thought the titles showed credibility- we weren’t neophytes, we’d been in the trenches of advocacy for a long time. It never occurred to me that, if we were speaking as individuals- which I made clear at the very beginning of the press release- that there was any issue in listing the organizations to which we were connected. It simply never entered my radar. I looked up the correct title for Barbara and for Cynthia on the CA website. Of course I spelled Cynthia’s name incorrectly. I knew that Rebecca was associated with the new coalition, but did not know of her other Columbia connections and in fact, met her for the first time at the press conference. I made about 20 copies of the press release and handed it out to reporters at the site and gave a copy to Chris Merdon. I told Mr. Merdon he was welcome to use it in an ad. He used the information exactly as I gave it to him. 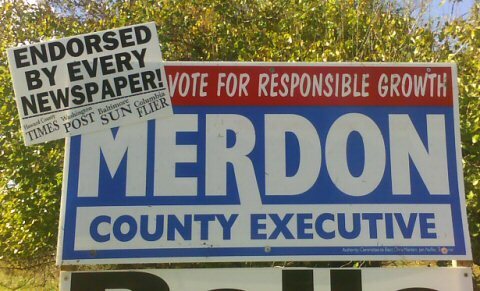 I know it’s more exciting to believe in conspiracy and evil strategy, but the simple truth is that we were just trying to let voters know that this small group of hard-working community activists supported Merdon for County Executive. I take full responsibility for the content of that list of names. The fallout and outrage has been way out of proportion. People’s jobs and livelihoods have been threatened, their ethics have been called into question. We need to get a little perspective on this. No matter where you fall in this argument, I encourage you to check your heart for your motives. If it isn’t a partisan issue, then there is plenty of time to review the circumstances and to create new regulations, if necessary. But a hastily scheduled special meeting that may or may not be closed to the public is not the right path towards change and it is far more dangerous precedent to our democratic tradition than any endorsement could ever be. Independent and Demcorats and Republicans! Mary Catherine Cochran, President of Howard County Preservation, continues her very public support of Chris Merdon for Howard County Executive. She has announced that she will be holding an open house in her home for those who have not made up their mind on the County Executive race. Saturday, November 4th between 4:30 and 6:00 p.m.
Post a comment here and I will forward to the host. On another note I spent Sunday afteroon repairing GOP campaign sigs that blew down during the wind storms. We were pretty lucky in that most survived. I didn’t see many Democratic signs being repaired. Merdon has updated his 4X8s as Dave Wissing pointed out.